Kausani Best Inn resort provides the much wanted respite to its guest with elegantly wooden furnished rooms with all modern facilities. Every room facing the Himalayas offering mesmerizing view of the Himalayas particularly Trishul , Panchachuli, Nandadevi and Chaukhamba peaks from the room as well as balcony and famous sunrise & sunset can be viewed directly from each room. Hotel Best Inn is always committed to make your stay memorable with its gracious hospitality in Kausani. Hotel Best Inn is located just 0.5 km away from the market crowd, in a beautiful spot of kausani. 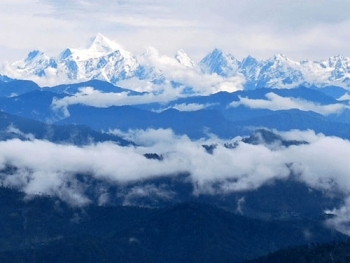 Kausani Best inn has total 8 Himalaya facing deluxe rooms, which are neatly maintained. Hotel Best Inn offers you all the modern amenities that ensure a comfortable stay for you. The rooms are 12ft X 24ft, with cross ventilation of double doors, each opening to 9 ft. wide balcony on both the sides of the rooms. Kausani hotel Best Inn have a Multi cuisine Open Air Restaurant Hut with extensive list of delicacies. Trekking Options: Rudradhari Temple and Waterfall, Kausani Old Tea Garden, Pinnath, Bhatkot, Pandu Kholi & Tarag Tal, Gannath, Aku Binsar, Khandi Devi, Baijnath, Bhatineshwar, Birchua "Grassland"
Extra Bed Charges : Below 6 year complimentary, above 6 years with extra bed -25% and without extra bed 15% of the per night rates. 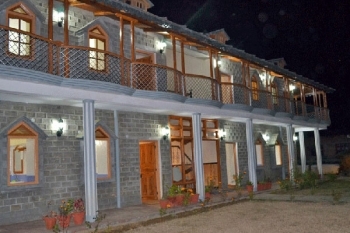 Hotel Best Inn in Kausani can easily be reached by road. The hotel is 405 Kms from Delhi. Nearest Railhead from Kausani Best Inn resort is Kathgodam, and you get plenty of taxi to reach Kausani.